You'll be £4.99 closer to your next £10.00 credit when you purchase Flying for Freedom. What's this? Alois Siska was born in Czechoslovakia and learnt to fly. He escaped to the UK after the German invasion and joined the RAF. He describes his experiences flying Wellington bombers. In December 1941 he was shot down and he and surviving members of the crew were adrift in the North Sea for 6 days in appalling conditions. Picked up by the Germans he underwent surgery to his badly wounded legs and became a POW. He suffered at the hands of the Gestapo and was held in numerous camps including Colditz. His injuries were so extensive that he was put under the care of Archibald McIndoe. Siska chose to return to his native country to join their air force but fell foul of the Communist authorities. His persecution is described in the closing chapters. His rank was restored only after the collapse of the Communist regime in 1989. Despite his injuries he remained active until 2003 when he died just short of his 90th birthday. 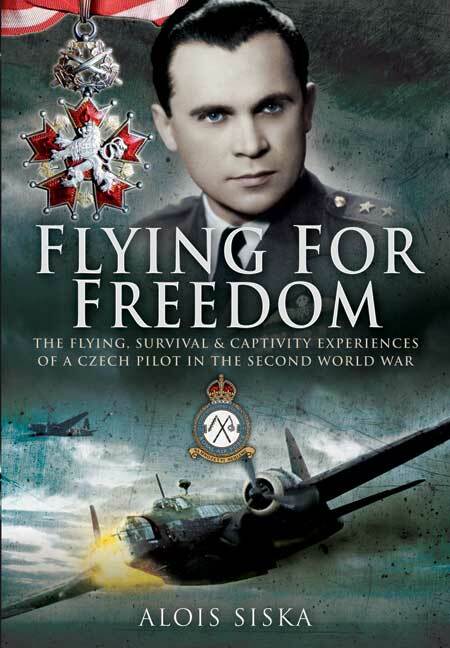 He was as an active member of the Czech Ex-RAF Association, the RAF Benevolent Fund in his country, and the Sue Ryder Homes for which he raised considerable funds. His death was marked with a fly-past of the Czech Air Force and he was posthumously awarded the highest military decoration - The Order of the White Lion.